On July 7th, 34 international students of Kyoto Prefecture boarded the bus for a 2 day field trip and homestay in Kyotango, in Northern Kyoto Prefecture. 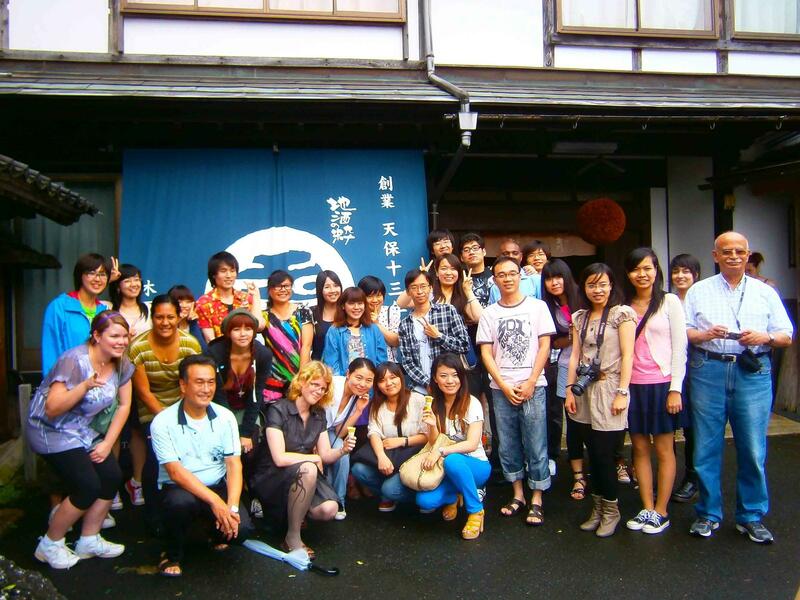 Having the opportunity to escape the heat and humidity of Kyoto City’s summer, everybody was really excited during the 3　hour-long trip, and participants became closer really quickly, forming friendships that I hope will last very long. Many corners of the world were represented in this event; indeed people came from various countries and regions such as Djibouti, Tonga, China, Taiwan, Hong Kong, Korea, Indonesia, Malaysia, Thailand, Vietnam, Sweden, Australia, Germany and Egypt. 14 countries in total! After having lunch at Sankaikan, we headed towards the Kinoshita Sake Brewery for a visit of their facilities and a sake tasting tour. On top of being located in a beautiful environment, surrounded by mountains and nature, Kinoshita Sake Brewery has another particularity: they have Japan’s only foreign-born Toji (master brewer and managing director), Philip Harper, born in Britain. As he is a very busy man, we weren’t able to meet him during the tour, but we got the CEO of the brewery to show us around and explain the brewing process of sake. At the end of the tour, we got to taste 2 different sakes. The second one was brewed by Philip Harper and was really refined and sweet; no wonder it has even won prizes! 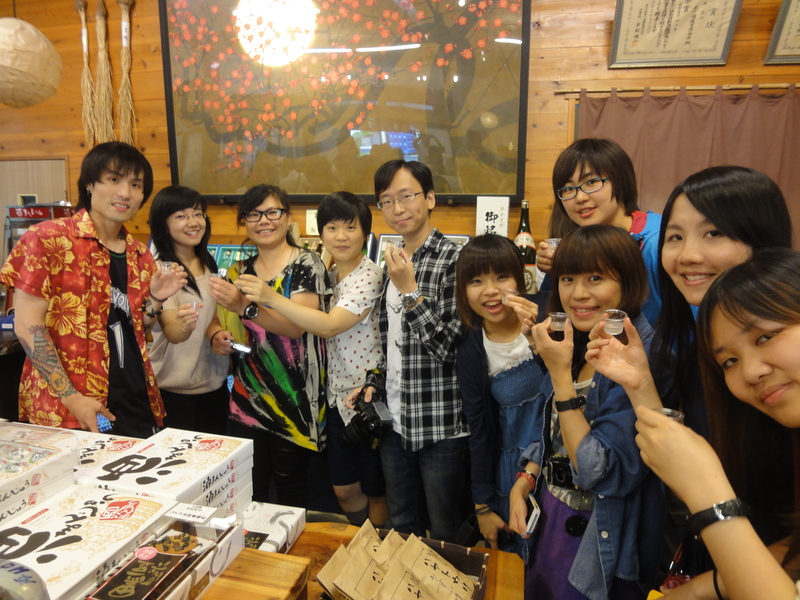 Some of the participants were adventurous enough to taste the sake ice cream made at the factory, some of them not even knowing it was made from alcohol. But apparently it was good and had a very special flavor, so I guess it was a nice experience for them. After the Sake Brewery tour, we went to meet the host families where everybody introduced themselves, before going home with them for the rest of the day. When we asked later, we found out that some of them went all the way to Amano Hashidate, one of Japan’s three most scenic views. I wished I could have gone too! Some had cooking or BBQ parties, tea ceremony experience etc… Overall, everybody had a very nice time experiencing life with a Japanese family and playing with the kids. 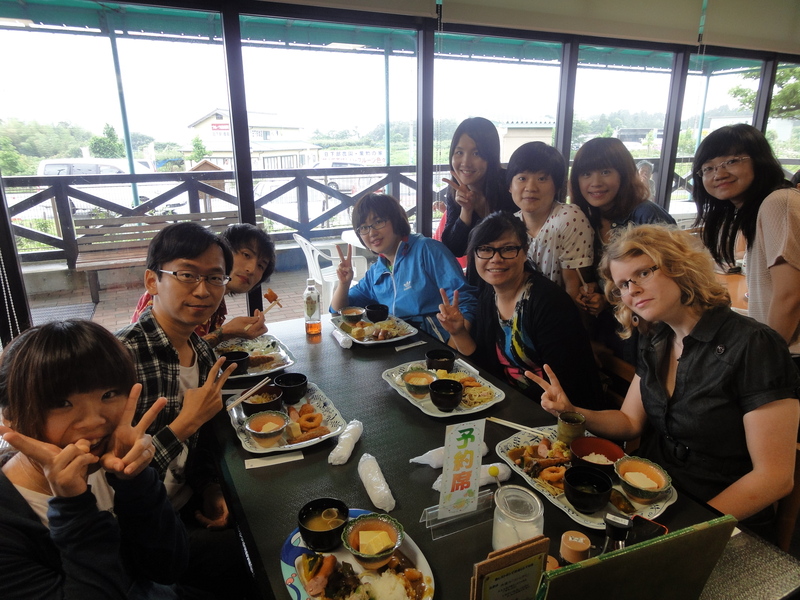 We gathered again on the second day for a “mochi-making (rice cake) exchange party”. 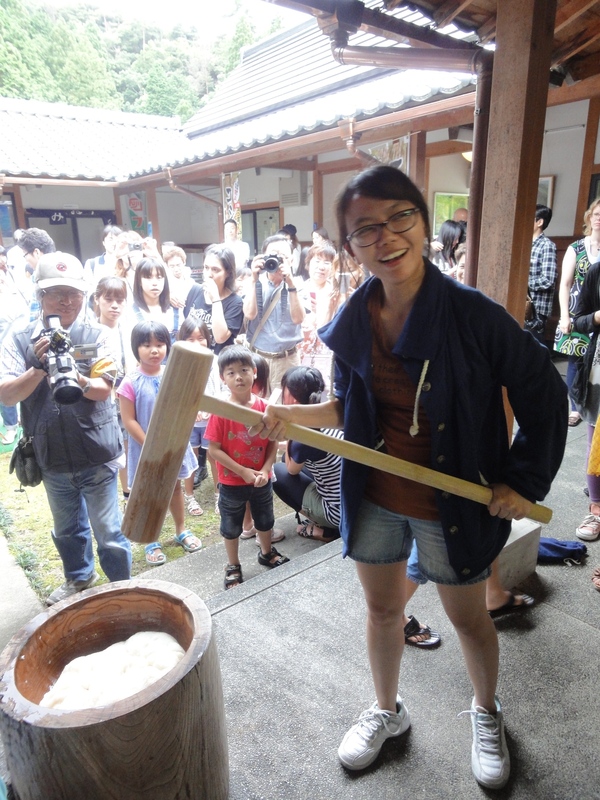 Participants first had to pound the rice with wooden mallets (kine) in a traditional mortar (usu). They had to work in pairs to alternate the work, one pounding and the other turning and wetting the rice cake, being careful to keep a steady rhythm or they might accidentally injure one another with the heavy kine. They then formed round shapes with the sticky mass of pounded rice and made their own rice cakes, chose the flavor they wanted to eat, between soy sauce, soybean flour (kinako) and red bean paste (anko). 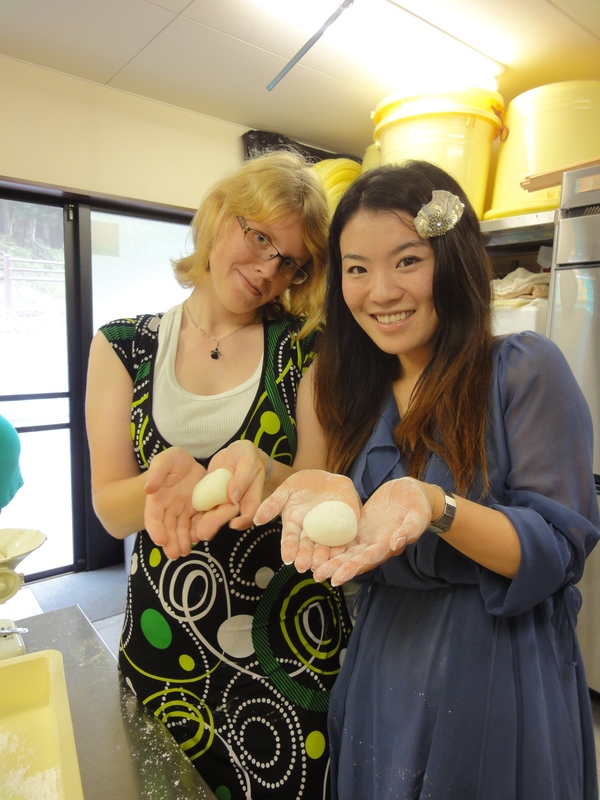 For many, it was their first time making mochi and they really seemed to enjoy the party. It was then time for goodbye…. After a lot of pictures, tears, smiles, hugs and promises to meet again, we got back on the bus to return to Kyoto City. Kameoka and Stillwater, Oklahoma became sister cities on November 3, 1985. Since then, the two cities have developed strong bonds of friendship through the exchange of student and citizen delegations and other joint events. This year, a group of citizens from Kameoka and Stillwater collaborated to put together a brand new exchange event. It all began back in March when a private group of 6 Kameokans, led by Kiyomi Kojima, traveled to Stillwater. During their visit, they started to talk about some of the barriers to cross-cultural exchange. One of the Stillwater members mentioned how nice it would be to have an exchange event “where kids in both cities can communicate through art, where there are no linguistic barriers.” This led to the birth of the Sister Cities Art Connection. Each group would hold events for kids to create artwork in their respective cities, and would then send the artwork to the other city for display. Ms. Kojima is the founder of Com Junto, a Kameoka-based organization, which, with the support of the city, planned “The Traveling Dragon Project” to fulfill Kameoka’s part of the exchange program. 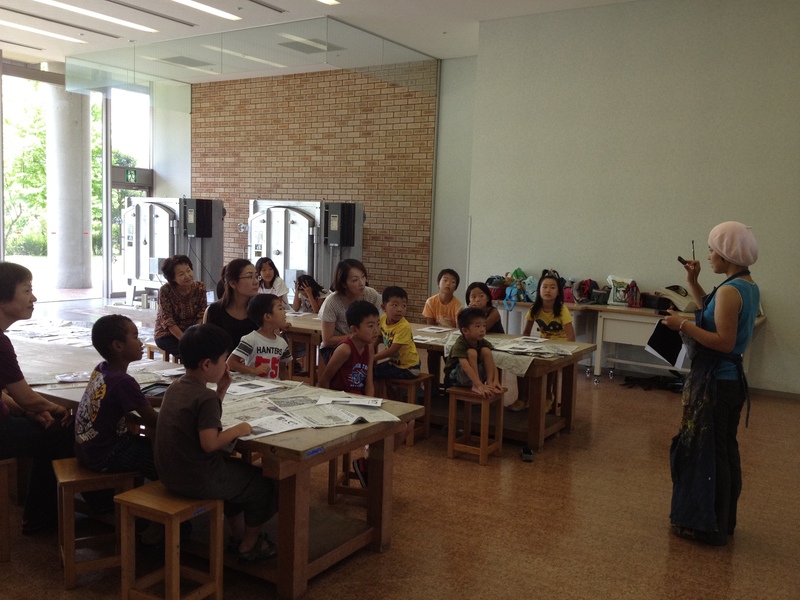 On July 31st and August 1st elementary and junior high students in Kameoka gathered at the Galleria Kameoka to learn how to draw dragons with instructor Makiko Berry, a local artist. I was invited to participate in the event and I began with a short indroduction about Stillwater and America. Rather than give an introduction about culture, however, I talked to the kids about how far away America really is, so they would undersatnd just how far their dragons will be traveling. Ms. Kojima and I also did a short discussion in English, which helped the kids think about the fact that the kids in America who will be enjoying the dragons do not speak Japanese, but a totally different language. 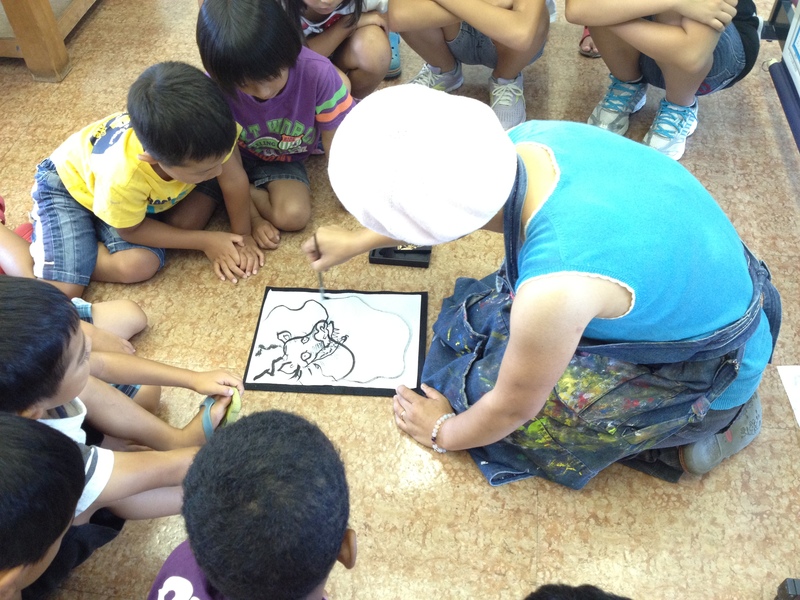 Then Makiko showed the kids the basics of how to draw a dragon to help them visualize their own image of a dragon. Then they were set free to draw on their own. 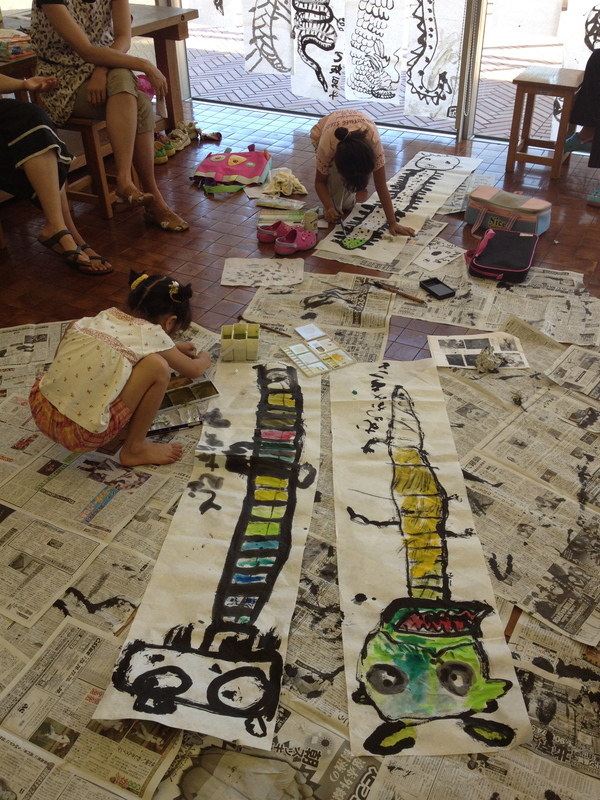 First the children worked only with traditional Japanese calligraphy paper, ink, and brushes to create the outline. Then they added colors to make their own unique dragon to send to their “brothers and sisters” in Stillwater. Some of the participants seemed a bit nervous to being, but once they dipped their brush in the ink, creativity won out. 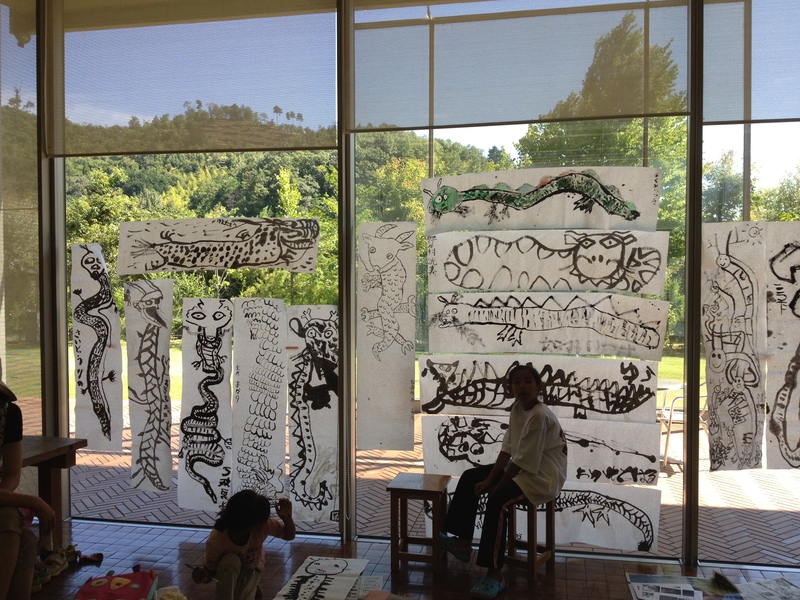 As the kids whisked their brushes across the paper, the room became filled with dragons. Some dragons were flying in the sky, while others were lying down or standing up tall. Later this month, the dragons will travel across the world to Stillwater, Oklahoma where they will be displayed at the Stillwater Multi-Arts Center. 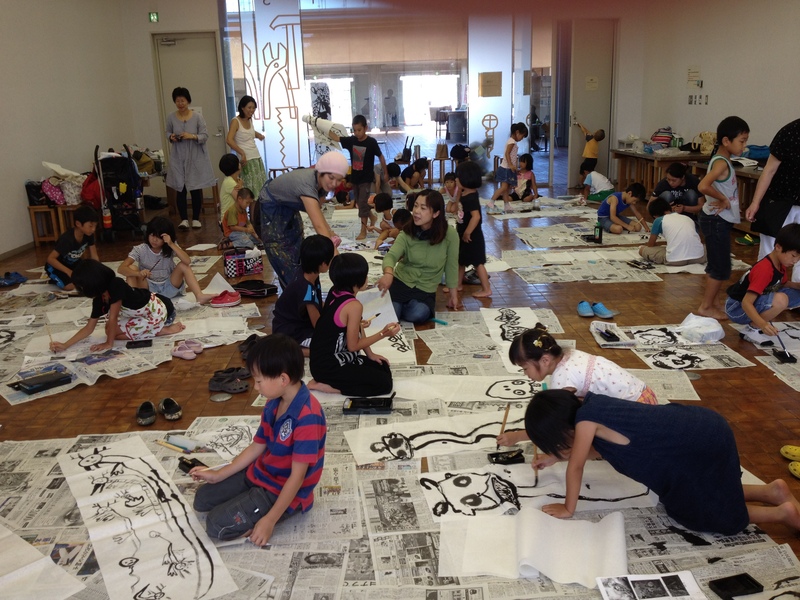 This Multi-Arts Center held a series of 4 summer camp events where kids in Stillwater created murals that will be sent to Kameoka and displayed at Kameoka City Hall and the Galleria Kameoka.